Cayman now face the Bahamas at home and although the loss to Bermuda will be a blow to the National team all is not lost… Cayman will need to achieve a bonus point win over the Bahamas this Saturday by scoring 4 or more tries to be in the best possible position to go through this round. The Bahamas will host Bermuda on June 9 and if Bermuda wins that game Cayman will have no hope of progression. However if Cayman (with similar home support that saw Cayman hammer Mexico) beat Bahamas and the Bahamas beat Bermuda then each team will have 1 win and 1 loss and it will come down to bonus points. 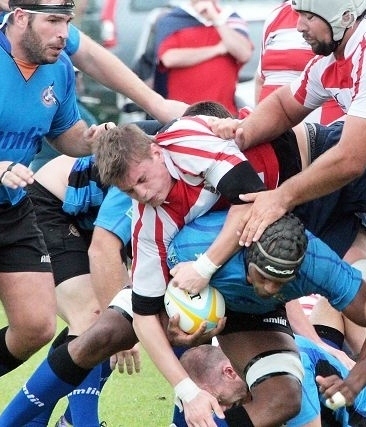 Cayman earned a bonus point in their loss to Bermuda by losing by less than 7 points, Bermuda didn’t attain any bonus points in their win over Cayman as they didn’t score 4 or more tries. So all is still to play for on 26 May when Cayman host the Bahamas for BIG GAME 2 at the Truman Bodden Sports Complex. Photo: Ben Blair of Cayman stops a Bermuda attacker at the ruck. Then you're an idiot. The end of a game (not only rugby) is commonly referred to as "the death" i.e. the END.